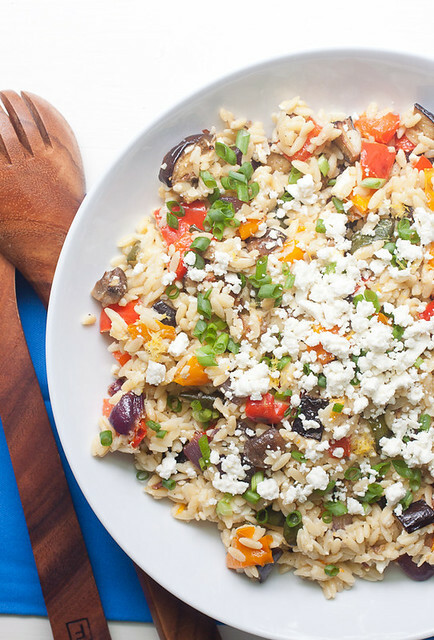 This roasted veggie feta orzo salad has been an absolute winner in my house for the better part of 10 years. With it’s lemon garlic dressing and deeply roasted veggies, seconds are always requested. Much like many of my friends who love to cook, I don’t often remake lots of dishes. Yes, these chicken fajitas (in other forms too) are one thing I keep coming back to. And this pizza is also a major favorite around here as well. Oh! And how could I forget about quite possibly the best yellow butter cake in the history of yellow butter cakes? 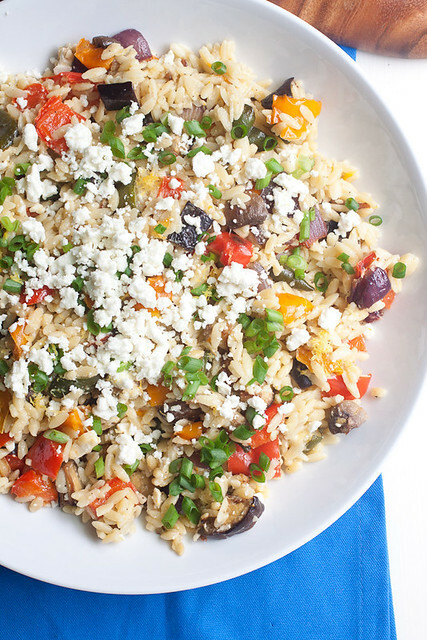 This roasted veggie feta orzo salad is probably the most unassuming dish that I have been remaking for years and years. At first glance it’s kind of meh, right? Buuut…the deep flavor of roasted summer veggies along with a super quick lemon garlic vinaigrette that’s right on par with Leonard Hofstadter’s approach to picking up a woman make this salad truly the one dish that blows my mind each time I make it. And I don’t relegate it to the summer either since all of the veggies I use are available year-round. I’ve brought it to potlucks, served it to company, and hoarded it all to myself for lunches (sorry Kyle!) and I always, always get the same reaction from anyone who tries it – more please!! Use whatever vegetables you like for this dish to adapt it to your tastes. The great thing about this meal is that the more veggies you use, the further the dish will stretch, and if you’ve got a bunch of veggies almost past their prime that need to be used up (or leftover roasted veggies from another meal), this will be a cheap and easy meal for your family. I’ve also roasted the veggies a number of times with fresh herbs like thyme and rosemary, and have topped the salad with fresh basil, chives, and parsley. It’s one of those versatile salads that’s great any way you choose to make it! Preheat the oven to 425° F and toss the veggies together on two large baking sheets with salt, pepper, and a couple glugs of olive oil. Roast for 30-35 minutes until the veggies have softened and started to brown, tossing once halfway through. Meanwhile, add the vinaigrette ingredients to a mason jar and shake to combine. The lemon flavor may seem very strong at this point but it will mellow when tossed with the salad. When the veggies are finished roasting, add the orzo and veggies to a large serving bowl or platter, drizzle with the vinaigrette, and toss to combine. Season with more salt and pepper to taste. Stir in most of the feta and add the remaining feta and the scallions to the top of the salad for serving. Serve warm, room temperature, or cold – it’s one of those salads that you’ll love served at any temperature. I love the looks of this! So colourful and so full of yummy ingredients! Lots of great ingredients and very inviting in appearance. Makes me want to grab a plate. I made this for dinner last night…..it was AMAZING! Forgot the mushrooms (oops), but I did add some chick peas. I may have snuck a few bites this morning and it is even better the next day. Thanks again for a great recipe. Every recipe I have made for your blog has been top notch! I made this for my lunch today and I can’t believe how good this is! I switched out the orzo for quinoa to make it gluten free and I didn’t have eggplant or mushrooms so I just used tomatoes. I will definitely have to try it with either eggplant or mushrooms next time! Right?! That sharp lemon vinaigrette is the perfect complement to almost any kind of roasted vegetable and what I love so much is that you can basically use whatever veggies you have in the fridge. I figured quinoa would be a great swap for the orzo so thanks for confirming! So glad you enjoyed this, Bridget!